Fig. 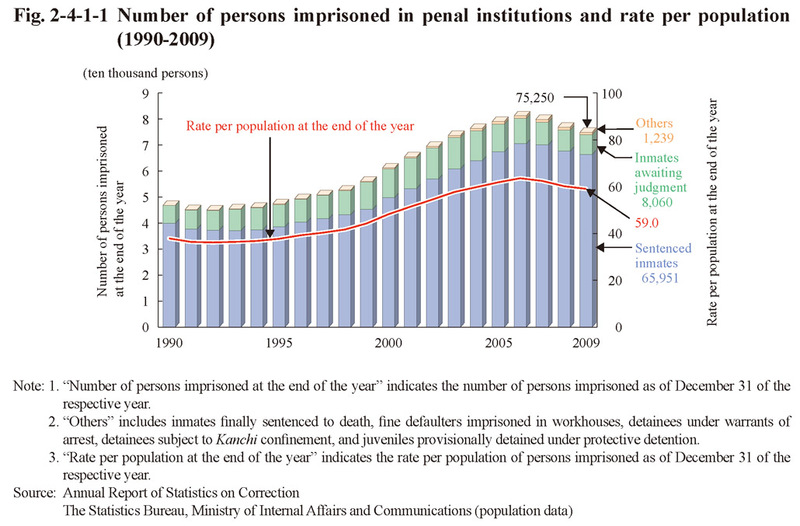 2-4-1-1 shows the number of persons imprisoned in penal institutions as of the end of the year and rate per population over the last 20 years (See Appendix 2-5 for the average daily number of persons imprisoned). 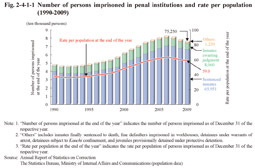 The number of persons imprisoned as of the end of the year continued to increase every year from 1993 on, reaching the record high of 81,255 since 1956, but then started decreasing in 2007, with the number of persons imprisoned as of the end of 2009 being 75,250 (including 1,132 fine defaulters in workhouses).